The area now occupied by Lewis County was very sparsely occupied until the end of the 18th century. Although the land was already claimed by the Province of New York in its original grant, the land was clearly part of the territory of the Iroquois confederacy until after the American Revolutionary War, when New York seized the lands from tribes that had supported the British. The lands were unsurveyed and remained unattractive to settlement until after the complex process of Macomb's Purchase of 1791 eventually put much of the land in the hands of John Brown. 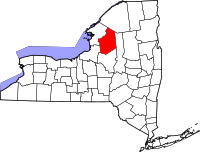 The area now falling in the jurisdiction of Lewis County, New York has changed jurisdiction many times, beginning as part of the originally enormous Albany County in 1683, then, after one of the many times that Albany County was divided, becoming part of Tryon County in 1772, which was renamed to Montgomery County in 1784; next, present-day Lewis County was part of Herkimer County in 1791, then part of Oneida County in 1798, and finally assumed its current name and borders in 1805. According to the U.S. Census Bureau, the county has a total area of 1,290 square miles (3,300 km2), of which 1,275 square miles (3,300 km2) is land and 15 square miles (39 km2) (1.2%) is water. Florence Augusta Merriam Bailey (August 8, 1863 – September 22, 1948) was an American ornithologist and nature writer. She was born in Locust Grove, New York. The third child in her family, she was the younger sister of Clinton Hart Merriam. Florence Augusta Merriam Bailey was born in Locust Grove, New York. Bailey grew up at her family's estate, "Homewood", in the town of Leyden, whose fields and forests in the Black River Valley between the Tug Hill Plateau and Adirondack Mountains provided an ideal environment for the study of natural history. She was encouraged in her interest in nature by her brother as well as her father. Her father was interested in scientific matters and was in correspondence with John Muir after meeting him at Yosemite in the summer of 1871. Born during the Civil War, Florence devoted her life to the study and protection of birds. From her work in ornithology she authored over ten books, including several field guides to birds, and close to one hundred articles. Though interested in birds as a child, she gained recognition as a naturalist while at Smith College. Disgusted by the use of feathers and whole birds in fashion, she started the Smith College Audubon Society. Edward McGlachlin (December 19. 1840 - April 22, 1931) was an American newspaper editor and politician. McGlachlin was born in Watson. ^ a b "State & County QuickFacts". United States Census Bureau. Archived from the original on July 13, 2011. https://www.webcitation.org/609eGquFW?url=http://quickfacts.census.gov/qfd/states/36/36049.html. Retrieved October 12, 2013. ^ Gannett, Henry (1905). The Origin of Certain Place Names in the United States. U.S. Government Printing Office. p. 185. https://books.google.com/books?id=9V1IAAAAMAAJ&pg=PA185. ^ "2010 Census Gazetteer Files". United States Census Bureau. August 22, 2012. Archived from the original on May 19, 2014. https://web.archive.org/web/20140519062322/http://www.census.gov/geo/maps-data/data/docs/gazetteer/counties_list_36.txt. Retrieved January 5, 2015. ^ "U.S. Decennial Census". United States Census Bureau. https://www.census.gov/prod/www/decennial.html. Retrieved January 5, 2015. ^ Leip, David. "Dave Leip's Atlas of U.S. Presidential Elections". http://uselectionatlas.org/RESULTS. Retrieved 21 March 2018. This page uses content from the English language Wikipedia. The original content was at Lewis County, New York. The list of authors can be seen in the page history. As with this Familypedia wiki, the content of Wikipedia is available under the Creative Commons License.